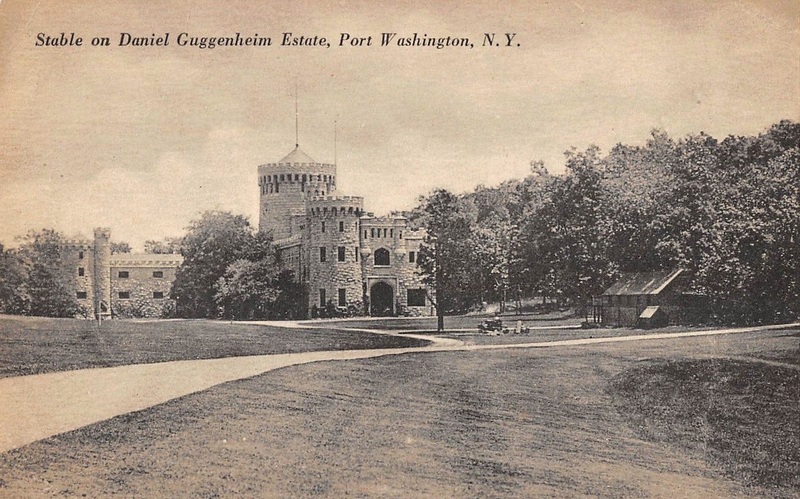 The stables to 'Castlegould'/'Hempstead House' designed by Augustus N. Allen c. 1902 in Sands Point. Click HERE for all previous posts on the estate. * What is that under the tree in the foreground? I can't make it out. * What was most likely the purpose of the modest wooden building tucked under the trees to the right? On Bing there is a different structure there. The modest wooden building facing that massive stone stable reminds me of the story a friend tells about her grandmother marrying an Englishman: As they approached his family's home she admired the house ... only to learn that was the gatehouse. Probably where a few Gould employees would be stationed dressed up as huntsmen, serfs or a shepardess tending their flock or sowing crops to complete the lord of the manor look of the estate. I presume kennel since it is visible from the great lawn and main house.